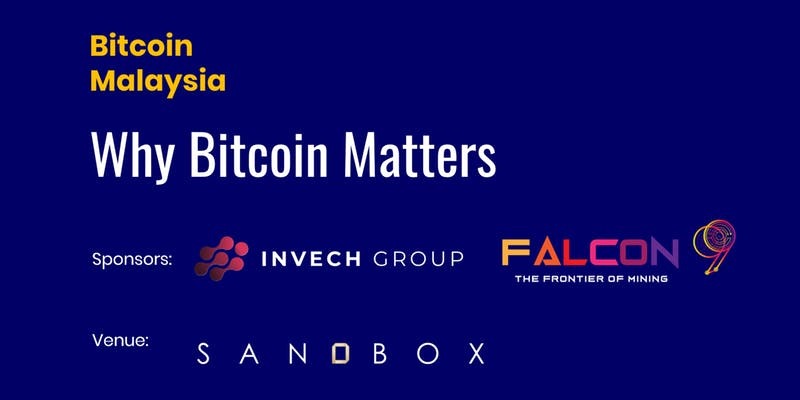 Since 2018, we’ve been hosting free events (this is our No.12 event), thanks to awesome sponsors like Invech.io and Falcon9. Join us for teh tarik and good company as Jason presents his simple-to-understand slides on Bitcoin and Blockchain. This week Bitcoin has seen a surge over $5,000 for the first time in 5 months. While speculators are getting excited again and HODLers silently rejoice, one truth still remains. Most people still do not know what Bitcoin really is and why it matters. What is a Bitcoin? Why does it exist? Why are world governments paying attention to it? What does it mean for you? What is this buzzword ‘blockchain’? Why is everybody suddenly talking about it around town? What does it mean for my business; large or small? Would it affect my business, my career options? All will be answered in just 2 hours. This time, come join us at Sandbox Coworking Space, Sri Petaling on 11 April (Thursday) 7.30pm -9.30pm in the evening. – Why is Bitcoin different? – How does it benefit you? – How can you get your first Bitcoin (or a portion of it)? Introducing our new Telegram channel: Blockchain Technology Events in Malaysia – https://t.me/blockchainmyevents.